SCVHistory.com LW2822 | St. Francis Dam Disaster | William Mulholland, Coroner Frank Nance, Others, at Hall of Justice, 1928. 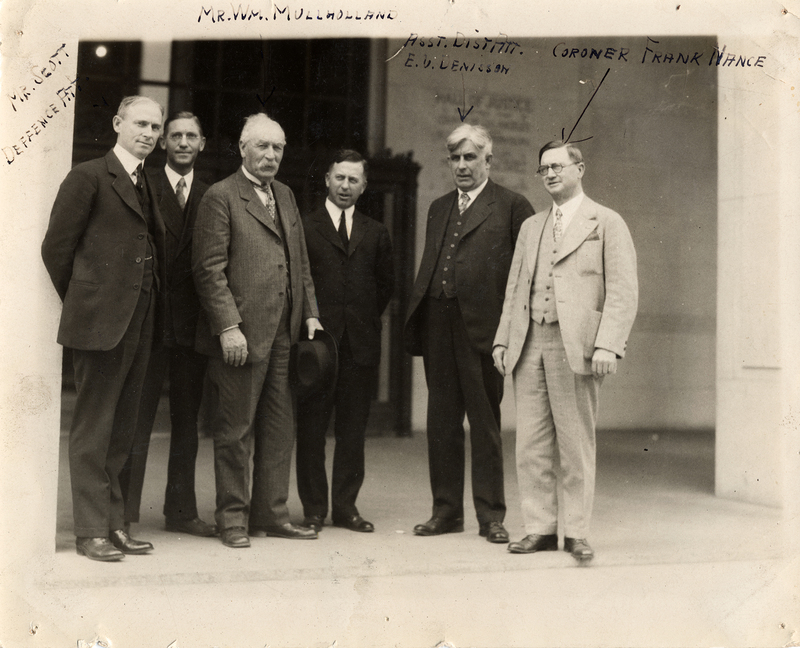 St. Francis Dam builder William Mulholland (third from left), chief engineer of the L.A. Bureau of Water Works and Supply (LADWP), with his attorney Mr. Scott at left; with Coroner Frank Nance (far right), prosecutor E.V. Dennison (second from right) and others at the 3-year-old Hall of Justice building in downtown Los Angeles after the collapse of the St. Francis Dam on March 12-13, 1928. Source of photo unknown. Scanned 2002, archived on SCVHistory.com in 2015. LW2822: 19200 dpi jpeg from large tiff (on file).